Description: Sugar Crush HD is a match-three puzzle game for Android with some very colorful and sweet visuals in the form of candy. The aim of the game is to match three or more candies in a row in order to score the highest score you possibly can and while this has been done a number of times before, Sugar Crush HD aims to be the most approachable and playable of these games. With no need to ask Facebook friends for extra lives, you just simply play the 216 (difficult) levels to your heart’s content. Take a look at the trailer below to get a feel for the game. 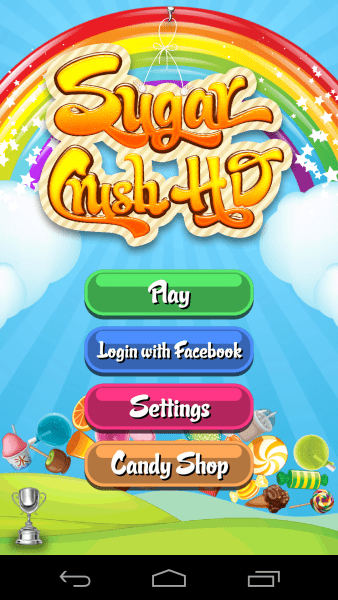 How it Works: Just as it is with any game on Android, you’ll need to download Sugar Crush HD from the Play Store. After that, you’re ready to play. You can sign in with your Facebook if you want, but there’s nothing that says you absolutely have to. There are 216 levels in Sugar Crush HD, spread across numerous different Episodes, so there’s plenty of levels to go through. The aim of each level is to meet the required High Score. There’s a slider that you can see at the top of each level, as it gets closer to the end of the slider, you’ve almost beaten the level. However, you need to be quick as you only get 121 seconds each time to complete a level. There are a number of game modes to play like a timed game mode, you can collect the fruits and candies as well and there’s a max limit of 50 moves per game. There are different levels to meet, hit the bronze star and you’ve completed the level, but it’s a good idea to go for the highest score possible. As the levels are quite difficult, you might struggle to complete the level, but you do get a number of skips and you can retry the level whenever you like. 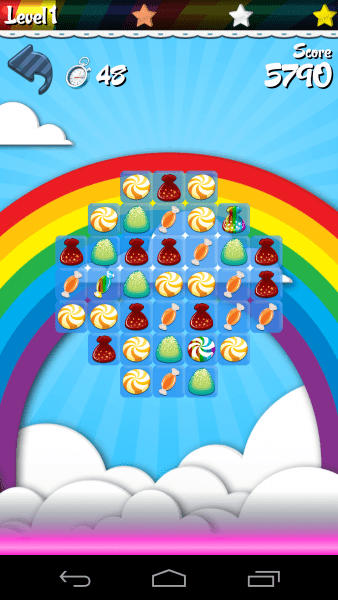 Opinion: While we’ve seen games like Sugar Crush HD before, that doesn’t make this any less fun and with 216 levels on offer, there’s a lot to do here if you liked Candy Crush or similar games. 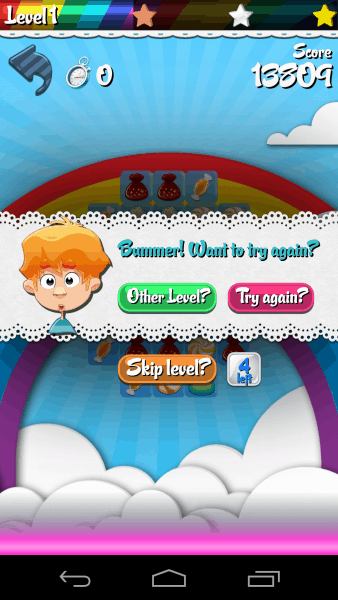 Thanks to the simplicity of Sugar Crush HD however, anyone can play the game, even if it is very difficult. Unlike other similar games, you only need to log into Facebook to connect with friends, it’s not a requirement and there’s no spam that will end up reaching your friends. The match-three gameplay is nice and easy to get into and it’s also extremely challenging. Depending on how good a puzzle gamer you are, you’ll welcome the difficulty, but casual players might struggle. Speed (4/5) – It’s a fast game and with 2-minutes per level, the gameplay is pretty fast-paced. 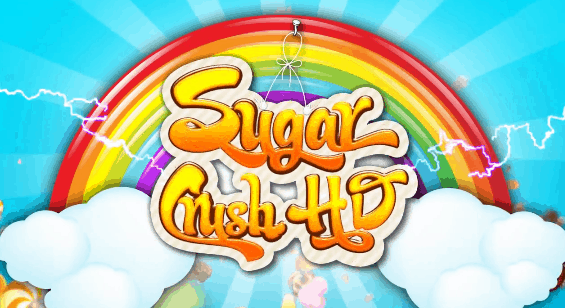 Features (4/5) – It might be similar to the same game we all know and love, but Sugar Crush HD is still a lot of fun, and it’s easy to pick up and get used to. Theme (5/5) – There’s no denying Sugar Crush HD is a good-looking game, and the sound effects are really nice to listen to as well. Overall (4/5) – Sugar Crush HD is still a fun game, despite the fact that it looks like many other games, it plays well and presents a great challenge to users old and young. Easy to pickup and play, but there’s a serious challenge here as well. No need to sign in with Facebook, but the option is there if you want it. Time limits are included which give the game a fast pace. Good-looking graphics and cool sound effects deliver a pleasing experience. Does feel a little too familiar. For some, the difficulty might be a little too steep as even I struggled with a number of the earlier levels. Conclusion: Sugar Crush HD is a familiar game, which might be a turn off, but it’s still a lot of fun and the sound effects really help sell the game’s replayability. A fun game that looks the part and has a lot of levels on offer, Sugar Crush HD is a fun game that those old and young will be able to take to. Some might struggle with the earlier levels, but you do get a number of skips in order to keep going. Whether you’re looking for more of the same of something a little bit different, Sugar Crush HD is a fun game that everyone can play. The post Sponsored Game Review: Sugar Crush HD appeared first on AndroidHeadlines.com |.